Your words matter. Do you KNOW how MUCH your words matter and what your friendship means? Do you really know your worth? You should. But just in case you haven’t been told lately, there’s no better month than August to remind you. 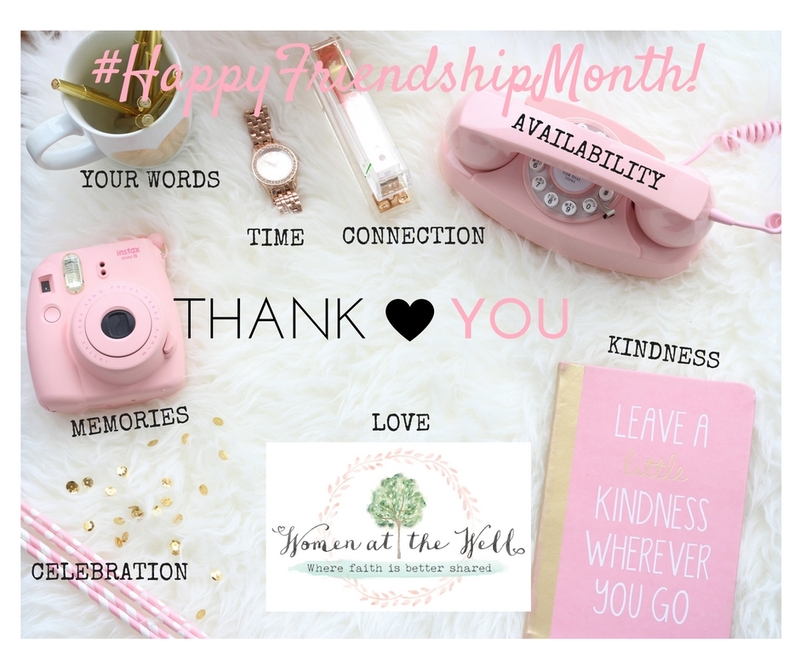 Because August is officially Friendship month! And friendship is everything to me. It’s why the SONshine Box was created (if you don’t know about it, then check it out here). And friendship is also the foundation of Women at the Well—where faith is better shared. I don’t think it’s coincidental that just this month I experienced how valuable our words can be to a friend—or even to a stranger who quickly becomes a friend. Recently I sat at a large round table at a weekend women’s conference. We were all dressed in our best, and maybe some of us were hiding our mess under well-worn smiles. Even trying to cover up laugh lines and creases that hinted of late-night cries. But many bravely cracked through facades and broke unspoken codes, sharing hopes and dreams with complete strangers. Inviting vulnerability and authenticity to pull up a seat, so we could shake our pom poms of kind words to spur each other on. I looked at her like my little girl looks up at me when I use words that are as big as her hair bows and way beyond her vocabulary. And like my little one, I sat there dumbfounded, but delighted. I fumbled for words like I do when I hurriedly search for my keys—that are in my hand. Or for my glasses—that are on my head. And then it was as if God was sitting there with us, sliding His Kingdom keys across the table and placing a vase full of beautiful flowers before us. I selected sweet sentences that would leave a lasting scent, offered petals of love, and spoke key words that couldn’t be mine. She gave me a “thank you” smile as I slid His words across the table, but kept the priceless moment as a parting gift to me. You can see why it’s SO important that we celebrate each other. With our words and our worth. SO I’m celebrating YOU and the GIFT OF WORDS AND FRIENDSHIP with a giveaway. You’ll get a chance to win a friendship gift basket at the end of the month. But in the meantime, share this post with a special friend, or friends, to tell them that their words matter and that their friendship means the world to you. Go ahead. If any of the statements below apply, slide this note across the virtual table to them. Just to say THANK YOU. Here goes. 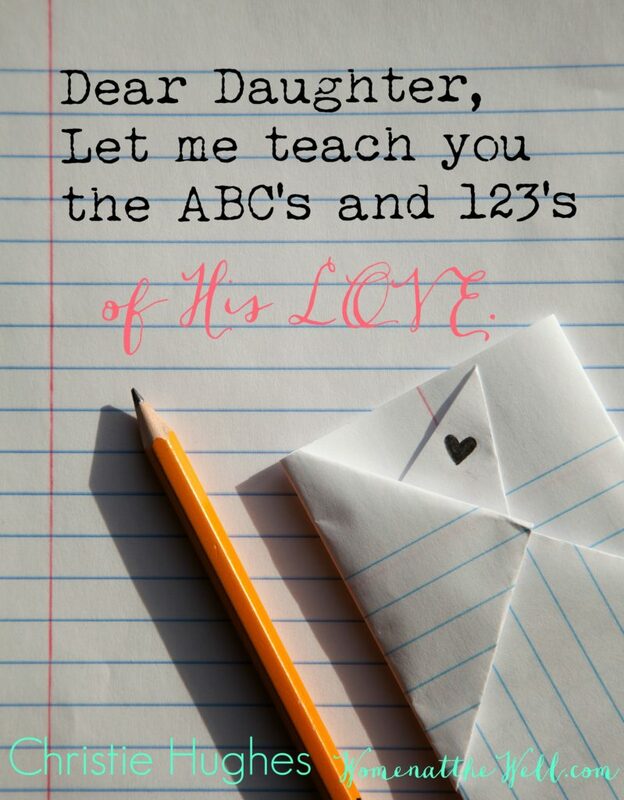 For words of love and encouragement. For spending time with me and investing your belief in me. For connecting your heart to mine. For your availability and meaningful conversations, the audible ones, and the ones quietly typed out. For sharing memories and capturing moments with me. For showing me the pure love and kindness of a friend. And AGAIN, THANK YOU for the power of your words—keep saying them. And for prayers I may never even know about—keep praying them. Enter to win the Friendship Gift Basket. And if you’re new here, and if we’re not already, LET’S BE FRIENDS! I’d love for you to subscribe to the blog, Like us on Facebook, and share us with YOUR friends. 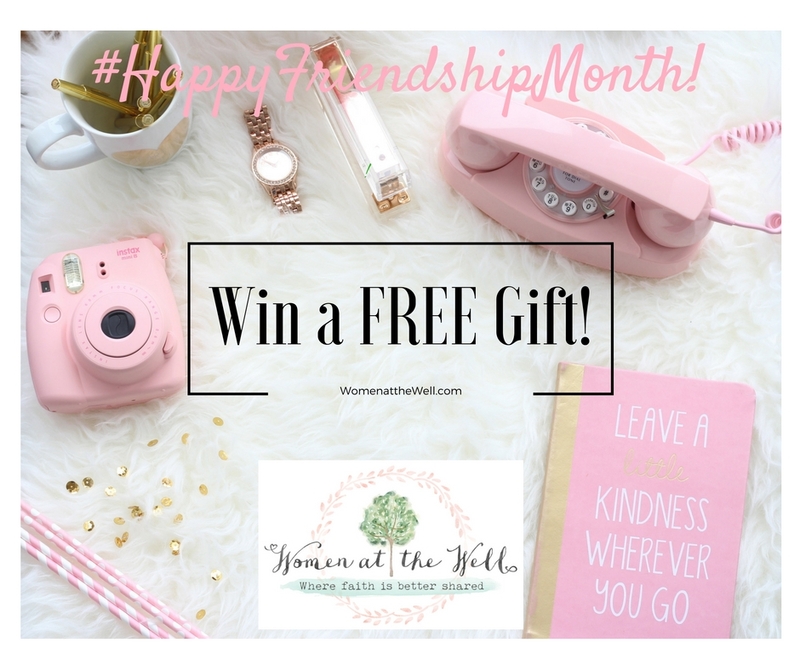 Now enter to win a Friendship gift basket, filled with some of my favorite goodies we’d share during a girlfriend outing. We’d surely share faith stories over coffee (or I’d forgive you if you ordered tea), and talk about the books we’re reading, the blessings we’re journaling, and then I’d listen for your “Yes!” when I asked if you had time to stroll through my favorites—Hobby Lobby and Charming Charlie’s (so we could get our creativity and our bling on). “The Dr. said there’s no heartbeat.” My little brother’s words assaulted my ears and blew my mind, leaving my own heart racing and twisting my stomach into a tangle of knots. They’d prayed for a baby, believed for healing, and then I received a blessing. “You’re gonna be an aunt!” I practically had the whole nursery design completed for them before God cradled and lifted those words back up to Heaven. And a miracle became a miscarriage and a prayer that was answered turned into a question that wasn’t. So what do we do when our grim reality collides with God’s limitless ability? That’s what I pondered as I piled up tissues and collected gifts for the SONshine Box I had never planned to make. Unlike the gift box, I couldn’t wrap this one up neat, or make all the pieces fit, much less place a pretty bow on top. As much as I tried to straighten every crease, smooth out the crinkles and the questions, and then fold in all the right reasons, it still didn’t look right. Didn’t seem right. Not even when I taped on His Word. The result was that life still looked messy and torn. I couldn’t reconcile why God would give a gift He was just going to take back. And enough was enough. My sister-in-law had already battled through PCOS, an endocrine disorder that can bring infertility, and YET like my favorite woman in the Bible, that one with physical issues, she pushed through the obstacles of time, doubt, and fear, and she received her healing. And I thought of my brother hearing, “Son, you’re going to be a father.” Those words would have to come from God because he’d already buried both parents in his 20’s. Days later, I trudged up their driveway for her women’s Bible study that she wouldn’t cancel. Carrying my Sonshining gifts and hiding my cloudiest questions. Still asking, “What do you do, what do you say, when it looks like faith flatlines and dreams die?” I didn’t find the perfect answer, but I watched as God unwrapped a perfect example. We’d been a cozy five-girl Bible study group, with most of us just wanting to huddle around her that night. To cry. And then cry some more. But we didn’t. We couldn’t. A new girl showed up, so we exchanged quiet smiles and loud, knowing glances instead. Honestly, I kept waiting for the new one to leave so that us old ones could have a moment to grieve. But it got late, so we finally pulled out our surprise box of SONshine, and then we watched the real gift arrive. Because that night my sister-in-law became the gift. A vessel of God’s light shining forth. She didn’t tuck away grief and hide disappointment. She dug deep. Letting His words flow out. Gently pulling out her pain and reaching for His purpose. He’d healed her body and her fear, and now was a time to simply draw near. And grieve. And breathe. But even more, to STILL BELIEVE. 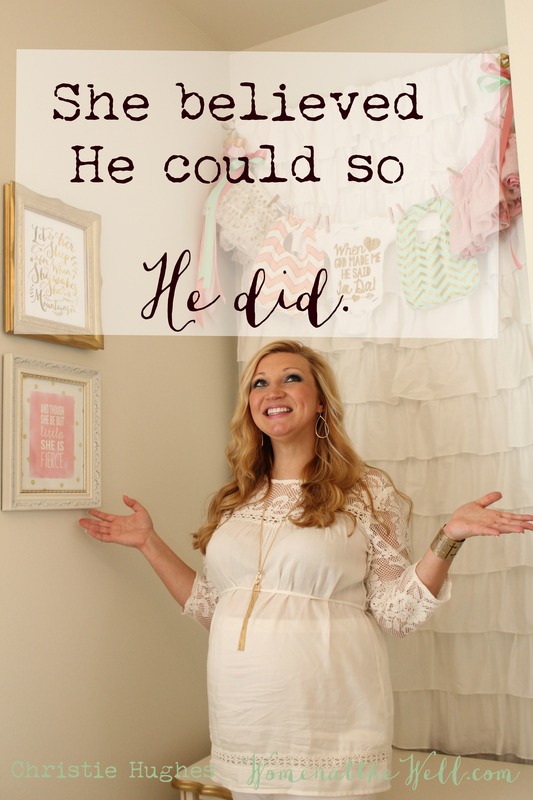 And she shared how a sign had gone up on her road the very week she’d been tempted to fear during pregnancy. It said, “Trust in me” with a picture of Jesus. She didn’t know who placed it in the ground, but she knew God tilled the soil for her faith and wrote those words on her heart. Because it’s easy to trust Him when everything is in place, but trust can only be activated when all we have is grace. 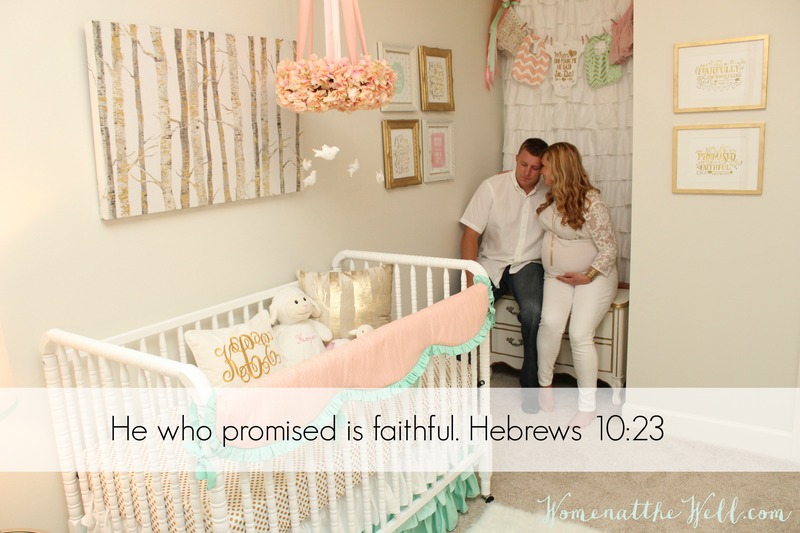 “I told God I would trust Him no matter what, knowing HE is enough,” she said. He is enough. Yes, enough was enough. Those words still echo, as I recall rocking in a chair, but sitting at a Well. Watching tears drip and walls fall. Listening to women, friends and strangers, freely share as He washed over us with buckets of love. 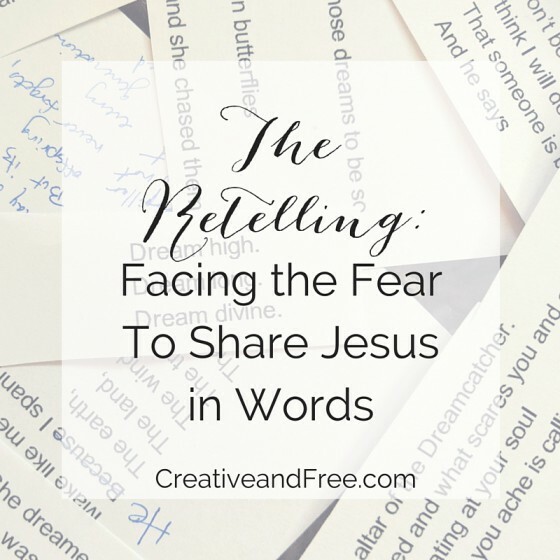 And that’s exactly what we did every week after that, as she poured out her faith and God’s love, encouraging women to surrender fear and to shred shame—and to never give up hope for their miracle. No wonder ladies went from trickling in to flooding in. Because she pointed to Him. And she still does. Because He was enough. And He still is. And that’s why and when we celebrate. And why I’ve made her my FIRST official “Well Done Woman,” here at the Well. Although that’s reason enough to celebrate, we’re also celebrating another first this month. The first birthday of her daughter and my niece. A one-year-old pure gift, all wrapped up in fifteen tiny little pounds. And though she may be little, she is fierce in faith already. And she sure is a keeper. She deserves a story of her own, so I’ll save that one for later. Meanwhile, comment and share your faith and your trust story here as I prepare to share some new SONshine Box ideas soon. Until then, I’ll sit at the Well with you as we trust and believe–no matter what–because He is enough.